I got carded! 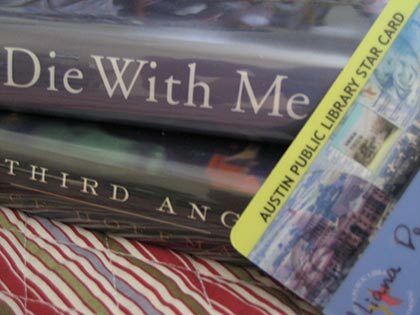 I went to one of the Austin Public Library branches yesterday and got my Star Card. I feel very official now. heh. The branch I went to is very close to me so that’s great right? Unfortunately this is not as good a library as my library in Dallas. I guess I got very spoiled because it’s a nice enough library but I miss the cafe, the comfy couches and all of the books that my library has. This branch is also quite small and to top it off they have one fiction section which encompasses everything – romance, mystery, etc. I’m not used to that. I like knowing I can go to the mystery section if I’m looking for a mystery book you know. Ah well, there are other library branches that aren’t too far from me either so I’ll have to check those out to see what they are like. Still I enjoyed using my library card and got two books out (the limit for first time use). I borrowed Die With Me by Elena Forbes (a British mystery) and The Third Angel by Alice Hoffman. I am going back to Dallas this week to spend some time at the Craft Guild working on my bookbinding projects so while I’m there I think I need to visit my old library. Anyway, hope to visit with the rest of you during the Sunday Salon but right now I’m off to brunch with a friend. Yay for library cards!!! Sorry the branch is not as extensive as your Dallas branch, but at least you can explore the system a bit more. Maybe find a comfy spot you love. I’m glad you got the card- it looks pretty! I know what you mean about the fiction section being separated out, so much nicer that way. I don’t like the sound of that two book policy very much. I’ve worked in several libraries over the years and I’ve never heard of it being done that way- not overly welcoming is it? Well, I hope you will be trusted with at least 3 books soon :). What is a Star Card? Do you have different grades of library cards and, if so, what do you have to do to get the top rating? I ‘love’ the idea of you only being allowed to take two books out the first time round. Is this so that they can check you’re not going to run away with them? Refer them to al your friends in the blogging world. We’ll soon let them know you’re AOK! Would love to have a library with a cafe! My library, too, mixes up all genres and it’s sometimes tough to weed through, even with the little blue “mystery” stickers on the sides. Fortunately, I’m halfway between my own town library and the library in the next town, and many times if I’m looking for a book, if it’s not at one library it’s at the other. And my library card is good at libraries all over the state! Congratulations on your star card. Yay for new library cards. I love mine. I lucked out in that it’s much better than the library I belonged to last. Hopefully one of the other branches will be better organized. Yay! Book angels rejoice in literary heaven when a person gets a library card 😀 I live in a small town (about 20K people) and our library isn’t the best. It’s not that it’s NOT good, just that if I read about a book or CD I want and check the library, often they don’t have it. To try to correct this problem, they’ve added a suggestion/request box. You suggest a title they should add, and when they get it they’ll call you (The suggester) and hold it for to get first. Sounds wonderful right? I’ve suggested two items, but after a couple months I gave up and bought them, then found out four or more months later they did finally get it and NEVER called me. I am surprised, though, that Austen, being a bigger city, wouldn’t have a great library. I’m with Kool-Aid Mom. I live in a small town also and our library is similar to hers. Our town library usually gets the second or third part of trilogies, but doesn’t have the first or second parts. Here’s A mini-tour of my town library, if you’re interested what life is like in the rural areas where people aren’t spoiled 🙂 and don’t have cafes in their libraries. I was so excited when I got my library card a few years ago. I haven’t been in the library in a couple of years at least, but it’s still nice to know I can go and check out books if I want to. I wish my library card looked as nice as yours. 🙂 Have a great week, Iliana. Andi – Definitely, I’ll do more exploring and see what I can find. I know the downtown library is a big one so I’ll have to check it out. Karen Olson – Hey good to see you! I guess I shouldn’t complain too much right – I mean I’ll be able to use my card at all the libraries in Austin so I’m bound to find a good one! Wisteria – I love the library. Seriously it’s such a good thing and I know what you mean. I’ll keep you posted on the Hoffman book. One of my friends read it and recommended it so I think it’ll be a good one! sassymonkey – ooh good for you! Yay for lucking out with a good library. 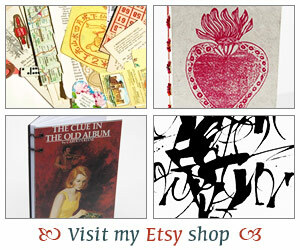 So have you already check out oodles of books? tanabata – It is pretty isn’t it? Much nicer than my other library cards! Okay I’m icky about blending in the romace with the fiction! Is it because the shelf space is limited at the library? A cafe? OMG! And here I am just happy they have most all the books I want. We are so behind here. I joined the San Antonio Library when I was living there and it was surprisingly good – about 3 floors of books, great opening hours…but not cafe! I live in Australia now and our libraries are AWESOME. I search a state wide online facility for a title, and even if it is located in a library a 22 hour drive north from here, they get it in for me at my local library. Yay! Have a good trip to Dallas and can’t wait to see the book you are finishing up! I was actually looking for The Third Angel at The Strand yesterday! Hmmm, perhaps I will have to order that online and will be eager to hear what you think…. Your library card is beautiful. At the library I work at they aren’t that nice. Does your library offer Inter Library Loan? We have ILL and if I don’t have it on the shelf I can usually get it for a patron within a few days. Most of our patrons don’t mind waiting. That’s one of the problems with me reading the books I own,there are so many to choice from in our system. Not to mention getting first choice when a book order comes in (shh, don’t tell anyone) 🙂 Enjoy your new library. Too bad your new library is smaller. Do they at least have other branches you can request books from? I’m lucky the branch I go to is also the main library, so the collection is pretty large. Fiction is split from romance, mystery, and sci fi, and the newest books are on display on the first floor with the older books being on the second. Of course it is in our downtown, which means it draws all sorts of unusual people. There is a cafe area, but it’s pretty pedestrian. It could be much nicer, but they are strapped for funds and do the best they can. Still I always have a stack of books from there, so I can’t complain. Enjoy! I’m glad you’re signed in and ready to go at your new library. Have fun in your old stomping grounds next week! Nice to see you, too, Iliana, and glad to see you’ve made your move so smoothly! I’ve been absent from blogs because I’ve been frantically writing on deadline. A new mystery series featuring a tattoo shop owner named Brett Kavanaugh in Las Vegas. First book will be out next July! Wow, that old library in Dallas sounds amazing — a cafe, couches, fiction grouped by genre??!! I can’t imagine. You’d be sorely disappointed in our library in NJ.